BUFFALO, N.Y. – Two recent graduates and a current student in Daemen College's highly specialized cytotechnology program were honored at a white coat ceremony held on Sept. 24 at Roswell Park Comprehensive Cancer Center, the college's program partner. Honored at the ceremony were Emily Almeter '17 of Gates and a native of Spencerport; Allison Christie of Erie, Pa.; and Kelsey Snyder '15, '16 of Cheektowaga and a native of Strykersville. 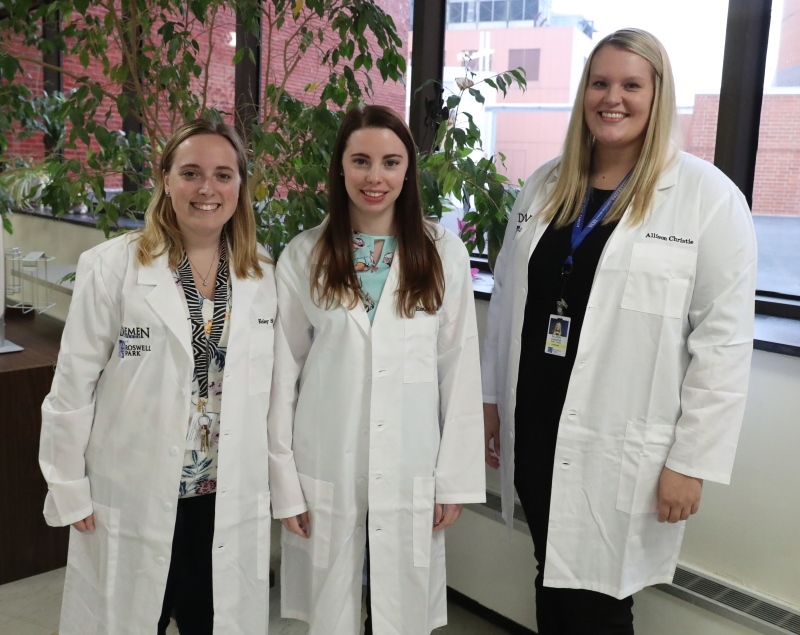 "This ceremony marks a milestone as these graduates and a student in her final year of the program start their journey as cytotechnology professionals," said Dr. Michael Brogan, senior vice president for academic affairs and dean of the college. "We congratulate each of our honorees and encourage them to rise to their greatest potential in their dedication to excellence in health care." Cytotechnology is a specialty within the spectrum of medical care that involves the microscopic interpretation of cells to detect cancer and other abnormalities. Daemen's program, which involves intensive study at both Daemen and Roswell, is offered as a 4+1 bachelor's degree in biology and a master's degree in cytotechnology. At the end of the program, students are eligible to take the national certification exam given by the Board of Registry of the American Society for Clinical Pathology. More information on Daemen's cytotechnology program is available by contacting Dr. Diane Ramos at 839-8560 or dramos@daemen.edu.